I think I am going to drop the “Friday for Serious” tag. When I first wrote it, I thought it was terribly clever. Now I think it just sounds stupid. Oh well. I can’t be incredibly witty and charming all the time. Last night my mom, Nikki and I went to a local restaurant called Ferdinands. It is a great little place just off the Square, behind the Lyric theater. They had several healthy options and I was quite impressed with the variety. 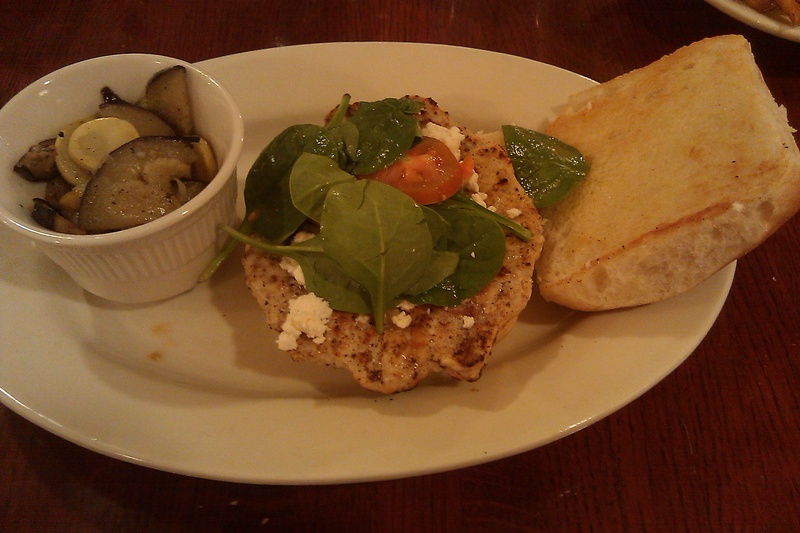 I decided on a turkey burger with feta cheese, spinach and tomato. My side was sauteed vegetables. It was incredibly good, but when I eyed squash and zucchini in the sauteed vegetables I threw up in my mouth a little. I had to be strong, for myself and you my readers, and try them. I told myself at the beginning of this journey that I would try anything once. Let me tell you now-I was wrong about squash and zucchini. These were sauteed in olive oil and they were delicious. 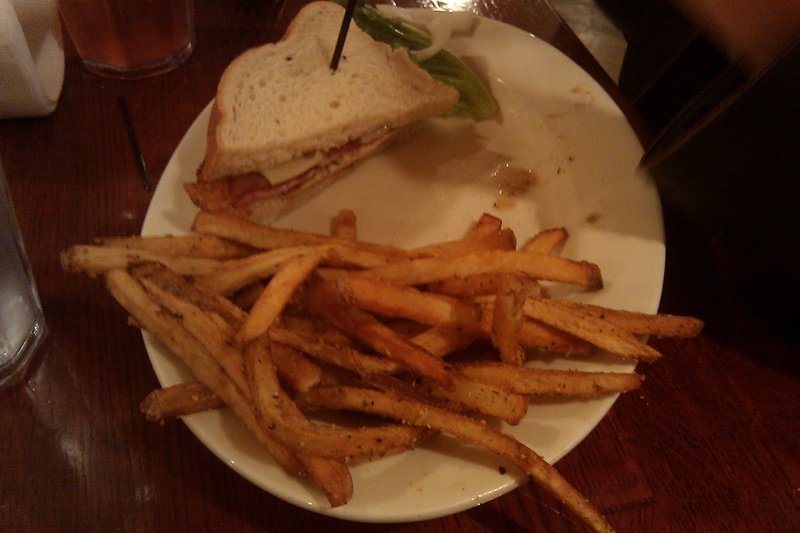 I even tried one of Nikki’s fries and said out loud that my vegetables tasted better! She thought I had been body snatched and checked to make sure I wasn’t hiding a pod somewhere on our land. 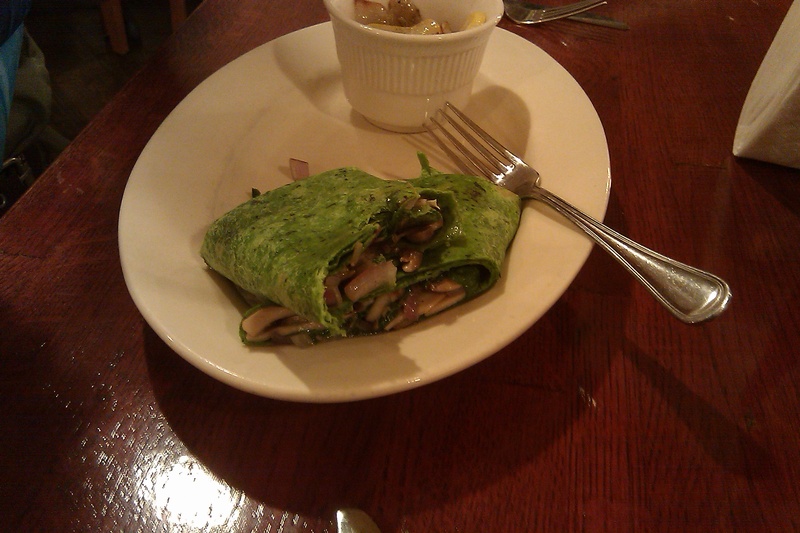 Nikki had a chicken club like sandwich that she really enjoyed: And mom had the veggie wrap: The only thing that turned me off about the veggie wrap were the mushrooms. I am sure at some point in this journey I will have to try mushrooms. I am not promising to like them! 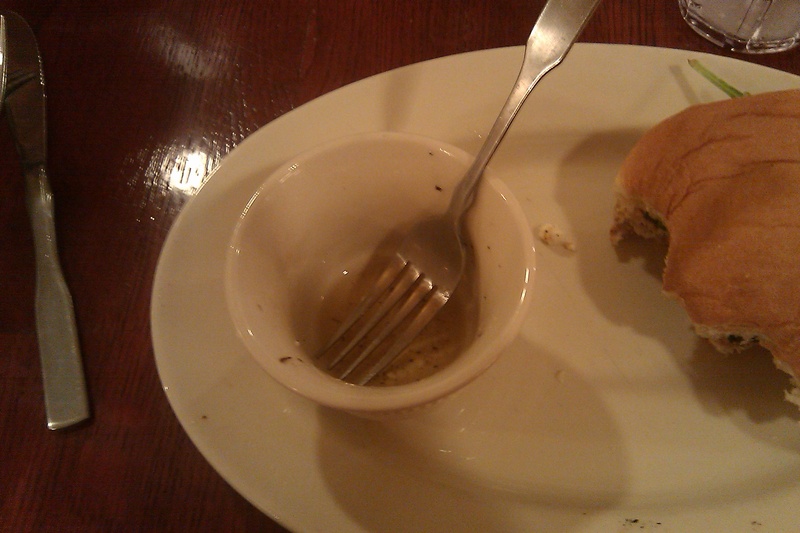 At the end of the meal we all gave Ferdinands six thumbs up. Try it sometime! My body is the sacred place, or temple, of the Holy Spirit. Who am I to think I can tear it down? Does it glorify God that I constantly try to repaint the walls only to have them dirty and chipping weeks later? Does it glorify God for the temple of His Holy Spirit to have muddy windows that no light can shine through? My blessings before meals were becoming high farce. “Lord bless this meal to the nourishment of my body” was barely off my lips before I was taking a sledgehammer to the temple walls. It was high time that I started treating my body as a place of worship. That I made it pristine and beautiful to boast to all about the greatness of the Lord. For me the way to do this was to make a huge change. Not just cut carbs for a few months until I am fifty pounds lighter. Not just cut out sugar until my teeth get whiter. I needed to take everything I was eating and throw it out the window; replace it with something new. Jesus makes all things new, and I pray that as he makes me new I can become a worthy vessel for His glory. That is true worship. Not just mind and heart and spirit, but body as well. Let us take up new rags and clean these windows. Let us allow more Light to come in. This was a great post . . . . . for serious. Thanks! Can you call it laughing out loud if you do it in your head so your cube mates don’t think you’re a lunatic? If so…I laughed out loud at your comment. That is definitely laughing out loud. I know because that’s usually how I do it. I love how your tags read “food, God, religion, The Incredible Hulk.” Hilarious! Thank you Blair! I always try to be funny in my tags. Also, maybe I’ll get a random reader who wants to read about the Hulk. Also, I didn’t know if anyone would get what I was referring to in the title. I thought you would. The only tv sitcom star you love more than Ron Perlman is Bill Bixby.